In this study, maqui berries were subjected to vacuum drying at 40–80 °C to assess and compare the effect on proximate composition, dietary fiber, phenolic and flavonoid compounds, antioxidant capacity and sugar content. The Weibull model was used for describing the vacuum drying process. The results indicated that the highest retention of total phenolic content (TPC) and total flavonoid content (TFC) was obtained after drying at 80 °C. Six phenolic compounds were identified and quantified by liquid chromatography. These were gallic acid, protocatechuic acid, ellagic acid, ferulic acid, myricetin and quercetin. In general, every phenolic compound showed a higher retention at temperatures above 60 °C. The antioxidant capacity of dried samples (ORAC assay) showed significant differences compared to the fresh fruit. Fructose and glucose were the two sugars present in the fruit. These results show that vacuum drying of maqui berries at 80 °C is an appropriate temperature for maintaining TPC, TFC, anthocyanins, sugars and dietary fiber with a shorter drying time compared to the other temperatures. 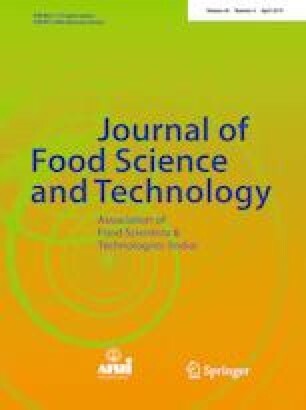 The authors appreciate financial support from the Food Engineering Department of University of La Serena and CONICYT-PCHA/National Doctorate/2016-21161653.